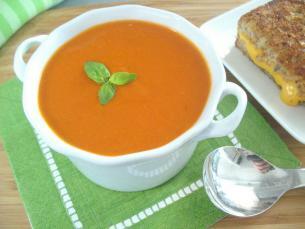 Forget “Mmm Mmm good”, this Tomato Soup is “Mmm Mmm great”! 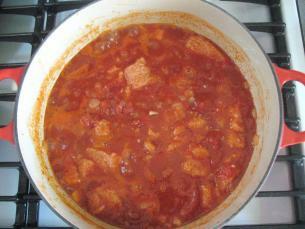 There is a surprise ingredient in this recipe which I’ll tell you about in just a second. It makes the soup taste smooth, rich and creamy without adding any cream! 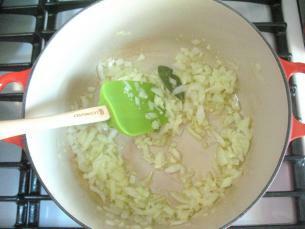 You will need a blender to make this soup, and you will also need to know how to chop an onion and mince garlic. There are also a few pantry items you will need. This recipe is made with canned whole tomatoes rather than fresh tomatoes, which makes it great a year round recipe! 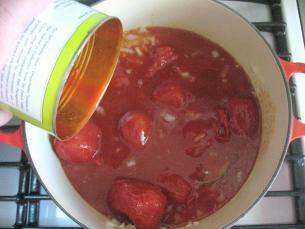 Winter tomatoes tend to be tasteless and the texture quite mealy. A bay leaf will add great flavor, but remember you don’t actually eat the bay leaf. 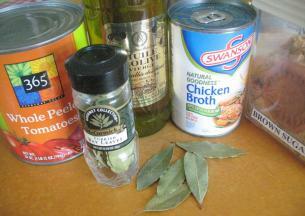 Olive oil, chicken or vegetable broth, and brown sugar complete the pantry ingredient list. As always, get all your ingredients prepared before you turn on the stove! 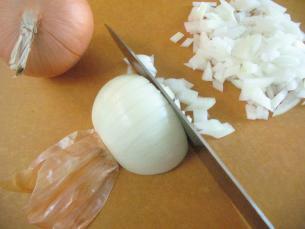 Start by chopping an onion. 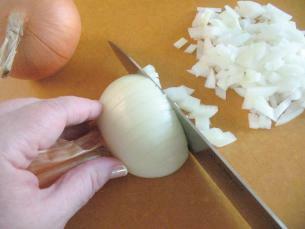 If you have difficulty holding the onion while you chop it, there is actually a way to make an onion holder out of the skin of the onion! 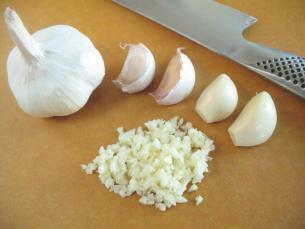 Preparing fresh garlic is not as complicated as you might think. 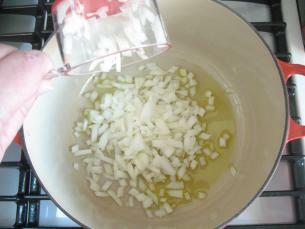 When recipes call for 1 clove of fresh garlic it usually means approximately 1 teaspoon of fresh garlic. I have minced the garlic for this recipe, but you could also have crushed it if you find that easier. The surprise ingredient is white bread! Yes it does seem like an odd addition but it will cook down and make this soup rich and creamy! 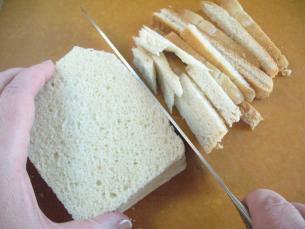 Slice off the crusts of the bread…. 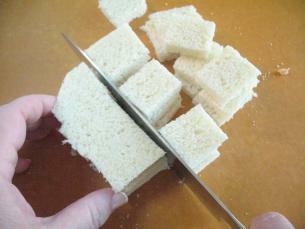 …and cut or tear it into 1 inch pieces. 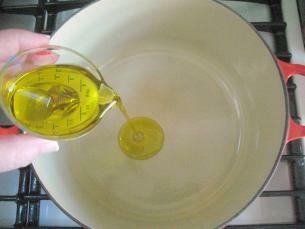 Heat 2 tablespoons oil in a large pot or Dutch oven over medium-high heat until it is shimmering. … garlic and bay leaf. 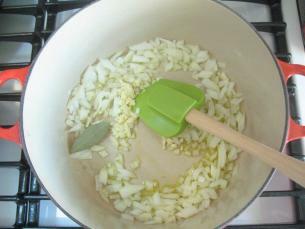 Cook, stirring frequently, until the onion is soft and translucent, about 3 to 5 minutes. 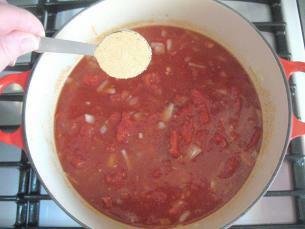 Stir in the tomatoes and their juice. 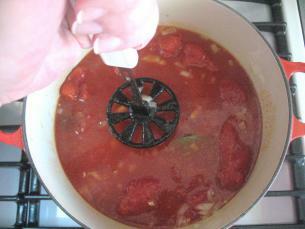 Using a potato masher, mash the tomatoes until the pieces are no bigger than 2 inches. …and give everything a stir. 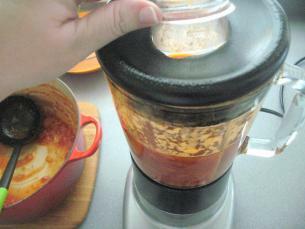 The soup now needs to get processed in a blender until it is smooth. 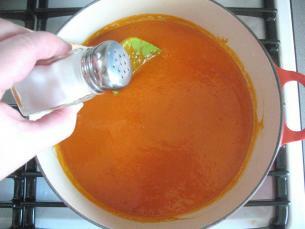 This needs to be done very carefully as the soup is hot. 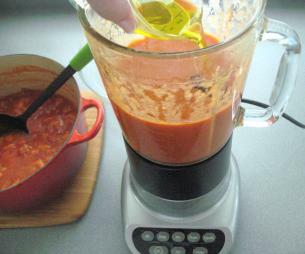 Set out the blender and have a bowl ready to put the soup into after it is blended. 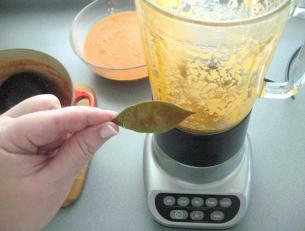 Remove the bay leaf from the soup and throw it away. It cannot be reused. 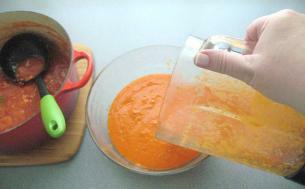 Scoop out the soup with a ladle and pour it into the blender. Only fill the blender half way with the soup. This will have to get done in 2 to 3 batches. DO NOT OVERFILL THE BLENDER. 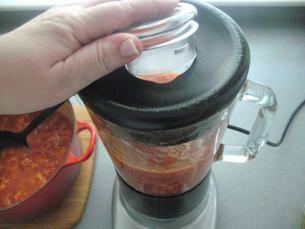 The steam from the hot soup will blow the top right off if you over fill the blender. Release the steam by leaving open a small crack in the plug on the cover of the blender. 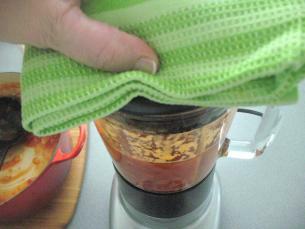 Put a kitchen towel over the lid of the blender to hold it in place. Now let her rip! 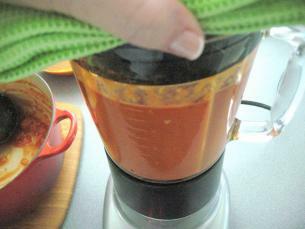 Process the soup for 2-3 minutes or until it is smooth. 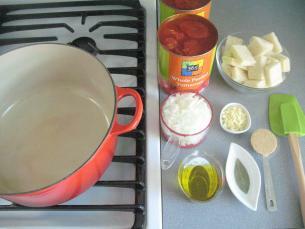 Good olive oil will really enhance both the flavor and the texture of this soup! 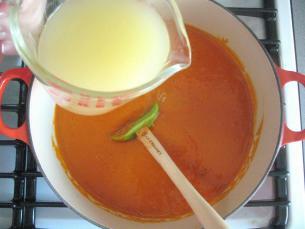 Now pour the soup into a bowl and continue processing the remainder of the soup. 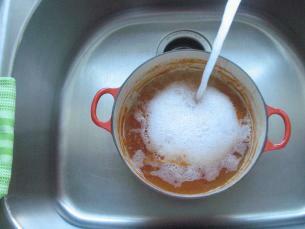 The soup has to get added back to the pot to adjust the thickness with some chicken or vegetable stock. Be sure to wash the pot first! Now pour the soup back into the pot. 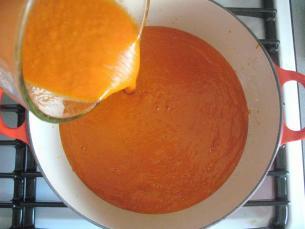 Add as much as 2 cups of chicken or vegetable broth until the soup reaches the consistency that suits your taste. …and pepper the soup needs. 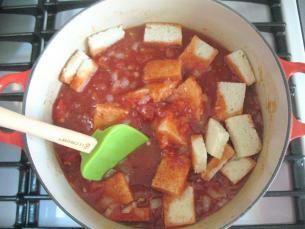 You can garnish this Tomato Soup with chopped basil, green onions, parsley, or croutons. This is GREAT! I love the substitute of the bread vs. cream. Can’t wait to try this. In a word, yes, you can use fresh tomatoes for this recipe but it does make it a bit more complicated. 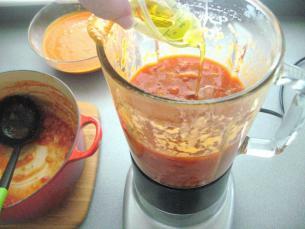 The recipe calls for 2 cans of whole tomatoes packed in juice (28 ounce), that would equal approximately 6-7 fresh tomatoes depending on their size. 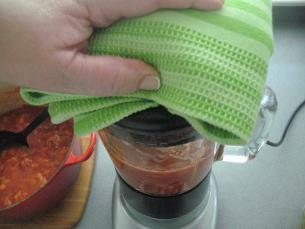 If you are using fresh tomatoes, remove the skin and seeds first. 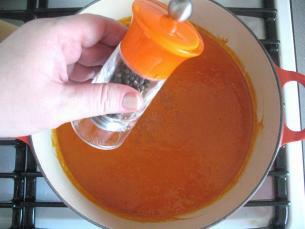 I have shown how to do this in my Gazpacho video as well as my post on How to Peel Tomatoes. This recipe looks great. 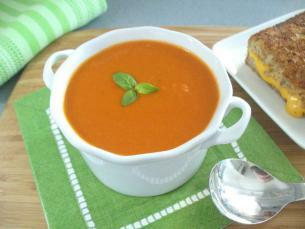 There is nothing like tomato soup and grilled cheese on those cool autumn nights. I’m going to have to try this recipe out. 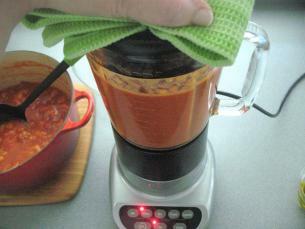 Thanks for posting how to make tomato soup….and, I’m very glad to see that you used your blender to puree the soup. My Bosch blender is about the only kitchen appliance I know how to use. Would whole wheat bread still dissolve into the soup? Yes, as long as it was “soft” whole wheat bread and not the really hearty, grainy bread. The texture will be slightly different but it should be OK. 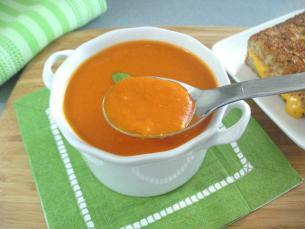 The bread I used for my grilled cheese sandwich (in the photo above) would have been way too grainy of a bread. 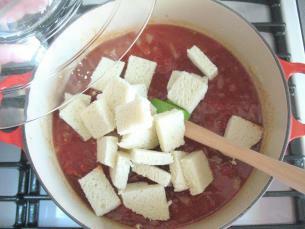 I would love to make some soup as the weather here has turned to COLD. But I am in France and there is no such thing as canned broth/stock. What can I use instead? HELP!! Hi Diana, That’s amazing! See if you can buy dehydrated granules or bullion cubes. You then just reconstitute them by mixing them with water and you have broth. Knorrs is an international brand that may be available in France. I just made this soup for lunch and it was WONDERFUL! Better than any canned tomato soup out there! The sweetness to the soup makes it perfect! I think the bread instead of cream absolutely MADE the soup. Thanks for sharing the recipe! Hi Rebekah! Yes this soup recipe is a real winner! Adding the bread, makes it thick, rich and creamy. I really like your blog. The photos are so clear and I get to follow the instructions of the dishes very well. Thanks WF! 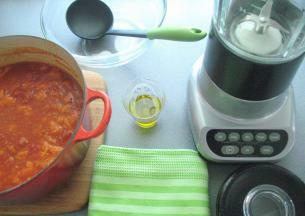 Lots of photos makes it much easier for a beginner cook to understand how things should look each step of the way! As I said in the post, the surprise ingredient is the white bread. It really does make this soup very rich and creamy. I hope your soldiers like my recipe!